Product information "Aqua Face Paint palette with 12 colors"
Professional greasepaint palette Superstar. 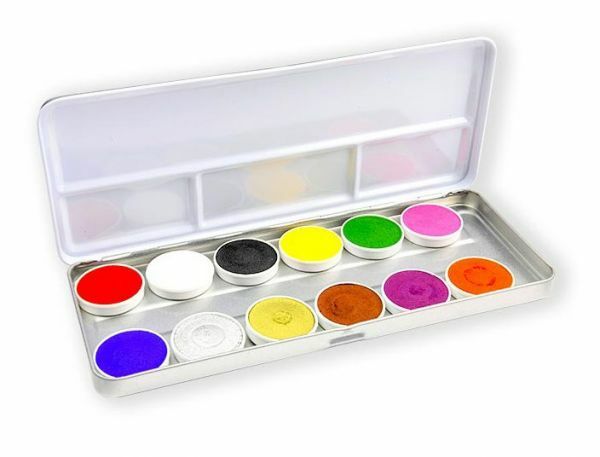 Face Paint palette with 12 colors: red, white, black, yellow, green, pink, silver, gold, purple, orange, bright blue and dark brown. Content: 2.5 grams per color. Luxury greasepaint palette water and therefore suitable for children without extra experience. The colors can be well miscible with a damp makeup sponge or brush the compact mass mix with a little water and smooth as thin and uniform as possible on the skin. The color dries matte and gives practical unfinished. Related links to "Aqua Face Paint palette with 12 colors"
Customer evaluation for "Aqua Face Paint palette with 12 colors"